This would be my vegetable dish when i ran out of greens. The only fresh ingredients are the Nappa Cabbage or ordinary cabbage and carrots, the rest are dried. There are many ingredients involved but even with a few ingredients less, this dish will be very flavorful especially if the sauce is right. This is a classic to the vegetarian and it can be a meal by itself for there are so many nutricious ingredients involved. Although this is a vegetable dish, dried oysters can be added for flavor and oysters are acceptable and considered vegetarian. In a wok, heat oil and stir-fry fermented beancurd until fragrant. 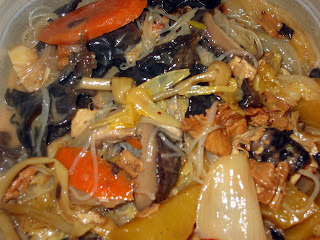 Add oysters (if using),mushrooms, cabbage and carrot. Stir-fry until cooked through. Bring to the boil, add the seasonings, then reduce heat, cover with lid and simmer. Add in the glass noodles and continue to simmer, you might have to add in more water/stock if the sauce has thickened too much. Do no be afraid to add more water/stock as the glass noodle will swell and soak up all the goodness. Dish up and sprinkle with sesame oil. 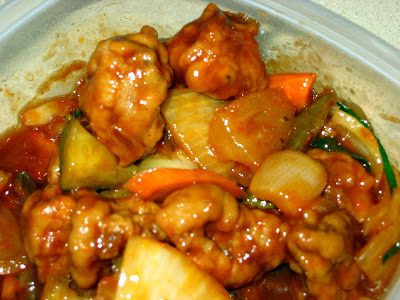 This dish is one of many homestyle recipes in the Cantonese repertoire. I remember my mom hand chopping the pork with a chinese cleaver to make this dish or any steamed pork. The hand chopping creates a more al-dente texture and it is worth the effort. However, this dish is still as delicious if made with ground pork. The salted fish of choise is the soft type as the hard type does not marry or blend well. 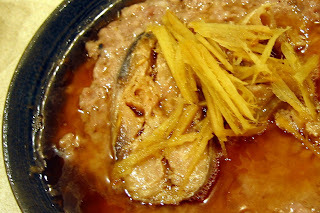 Mix pork with all the seasonings, then place the salted fish on top and spread the julienned ginger on top of prepared dish. 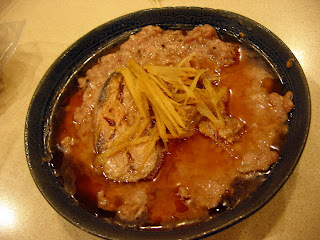 Steam until cooked in a steamer or put on top of the rice before rice cooker's function turns to 'keep warm'. This is a very traditional malay kuih in Malaysia which is served for breakfast or afternoon tea. I cannot have enough of eating this tuber and love everything that is made from it too. My mother and many of her generation, who had gone through the Japanese Occupation will not eat tapioca, perhaps it brings back bad memories of that era where they had nothing eat and had to depend on this tuber. I was trying to find out more of this tuber but ended reading about the Japanese Occupation in Malaysia and i now i can understand why my mother's generation has no craze for it. Banana leaves - washed, boiled and cut into 4 inch x 8 inch pieces. Wrap the cassava batter with prepared banana leaves. 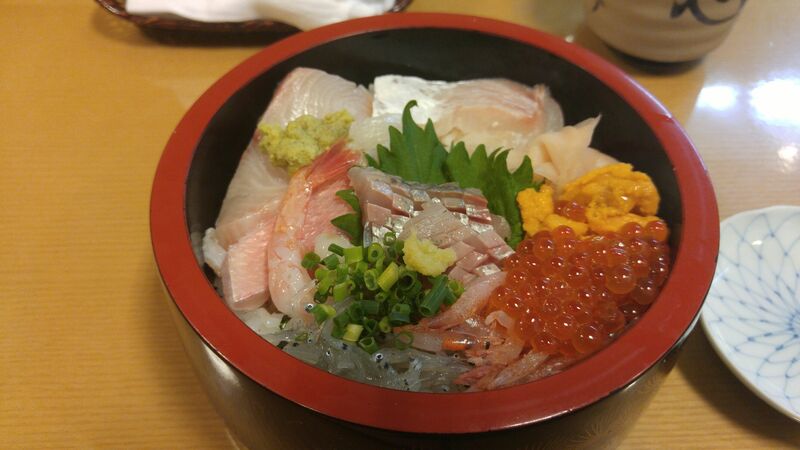 This is a traditional home-style dish. mostly passed on within families, and my paternal hokkien grandma used to serve this style which is very firm unlke the soft version. Trust me, it is VERY good as it is intentionally made to taste salty, so it goes well with white rice. Salted eggs are made with duck eggs but i will make with chicken eggs which are less expensive - there are 2 ways to make Homemade Salted eggs, i prefer this method better - Homemade Salted Eggs II. Separate the white of the salted egg from the yolk. Divide the yolk into four pieces and mix the whites to the eggs. Beat the eggs lightly. Mix in the ground pork and the seasonings. Lastly arrange the salted egg-yolks on top. Drizzle with garlic fragrant oil and put to steam on low-medium heat until cooked. Remove from steamer and drizzle with sesame oil. Boxing Chicken is a well-known finger-food for Cocktail Parties and instead of the usual marinate, the Enche Kabin flavor is used. Enche Kabin or Inche Kabin is a nyonya style fried chicken, which is so delicious that it needs no introduction. 12 chicken drummettes or 6 chicken wings. Remove the tips if using chicken wings and cut the remaining into 2 parts. Loosen the meat from the joint of drummettes and middle wing and push down to form a 'fist' shape. Remove the smaller bone from the centre part of the middle wing. Marinade with the seasonings for at least 6 hours or preferably overnight, covered, in the refrigerator. Pan-fry in a wok, stirring all the time until quite dry. Leave to cool. Heat oil till smoking hot, put in the chicken pieces and fry until sizzling subsides. Remove chicken pieces and allow the oil to heat up again. Fry again another two more times until crispy and golden brown. This dish must be older than i am. This will be the first dish that we, as children, will vote for everytime we ate out. Somehow, the craze faded as we grew as there were more choices in the menu. Now, if anyone said to order this dish, we would be scolded and said that this dish is only for 'Kway Lohs". There are endless variations of this quintessential chinese dish but it is always tastes best homemade. This dish is very easy to prepare and the sauce can be adjusted to your taste., unlike what you will get from the chinese restaurants in America where Ping-pong ball-sized pork are laced with red food coloring and the sauce overly sweet. In a medium bowl, mix the pork together with the flour, rice wine, salt, pepper, and egg, making sure to coat each piece of pork well. Marinate in the refrigerator for at least 2 hours. Bring marinated pork to room temperature before cooking. In a large wok, heat oil over high heat until it reaches 350 F, drop the pork a few pieces at a time into the hot oil, ensuring the pieces don’t stick together. Fry in batches, 7 to 8 pieces at a time, until golden brown and crispy. When done, remove the pork, shaking off excess oil, and drain on paper towels. Use a wire mesh strainer to remove any debris from the oil and bring oil temperature up to 350 degrees F before frying the next batch. Repeat with remaining pork. Drain the remaining oil and wipe down the wok with a paper towel. Heat 2 tablespoons of fresh oil over medium-high heat. Fry the garlic until fragrant. Add the pineapple, give everything a quick stir, remove and leave aside. 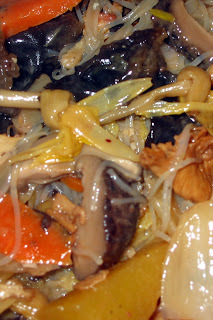 Mix the sauce ingredients together and put into wok, bring to a boil over medium heat, stirring continuously. Once the sauce starts to bubble and thicken, reduce the heat to low. Add the cooked pork nuggets and the cooked vegetable , toss to coat. Dish out and serve immediately with white rice. You may deep-fry pork the nuggets ahead of time. Refrigerate or freeze until needed. Then re-heat with a quick dip in hot oil or in the oven. Don’t forget to bring the meat to room temperature first. Pour batter onto lightly greased heated wok, pour in a scoop of batter and swirl it around to coat the sides. The remaining batter will flow down into the center and create the hump. Use very low fire. Cover with a lid to cook the hump faster. Fold the 2 sides in to cover the hump while it is still warm in the wok - it cools fast and becomes too crispy to fold. The night markets (Pasar Malam) in Petaling Jaya, are always very pleasant to go to, as it is not so hot, when the sun is down. Designated roads will be closed and hawkers will put up the tables and display their wares, they sell anything under the 'stars'. It's very nice to walk along all the stalls in search for something, anything you fancy. One of my all time favorites is this coconut wafer pancakes. I really missed these pancakes and when my other daughter, Sharon, sent me the tiny wok, i hastily went into action and made some. They were so good but, like any utensil, the virgin run's result will often go to the culinary god. Thanks, Sharon, these pancakes are for you, drool only - sorry. Sieve the dry ingredients into a mixing bowl and add in the rest of the ingredients and mix well until sugar is dissolved and there are no more lumps in the batter. Heat the tiny wok on low heat and grease light with oil. Cover with a lid to fasilitate cooking. When the edges are golden brown, scrape the sides and fold in the sides to cover the hump. Remove on to a cake rack to cool. Make more apong/appam with the rest of the batter. I wanted to make a cake which is rich and buttery with a lovely golden brown crust, and, it is the Pound Cake of course. and having made so many sponge cakes lately, which are light and airy, this cake seemed so heavy when held, felt like a ton, perhaps it's the cottage cheese. Most cheesecakes are made from Cream Cheese which is similar to Cottage Cheese but is higher in fat content, cottage cheese being made from skim or nonfat milk is a healthier alternative. This cake tasted better when kept, the crust will be softened and the texture of the cake is richer. Sift flour and baking soda onto wax paper. Using an electric mixer, beat butter and cottage cheese until smooth and creamy. Slowly beat in 1 1/2 cups sugar until fluffy. Beat in orange rind, vanilla and flour mixture until well blended. Gently fold the beaten whites into cake batter. Spoon batter into prepared pan, smoothing top evenly. Bake for 1 1/2 hours (the cake was done in 1 hr. 5 mins) or until top springs back when pressed lightly. When i visited my daughter before i moved here, we had lunch and she ordered this Stuffed Chicken Wings. She reminded me about this dish as she has not eaten this since the Vietnamese restaurant in downtown Denver went out of business. I guess that this dish would be Thai, if the stuffing is different but i made my stuffing which is quite similar to the Vietnamese Egg Rolls, so should my version be Vietnamese??. Thai or Vietnamese, this dish is so finger-licking good. Mix all the stuffing ingredients together and leave in the fridge for 30 minutes. Cut the chicken wings in two pieces and save the top joint of the chicken for another dish. For this recipe you need just the middle joint and the wing tip. With a small, pointed knife remove bones from mid-joint. Run the knife around the top of each bone, push the flesh down to expose the bone and carefully twist each bone out. Fill each chicken wing with mixture but do not overfill or they will burst when steamed. Place the wings on heatproof plates and steam over boiling water for about 7 minutes or until cooked. Leave to cool. Roll in rice flour or wheat flour and dust off excess. Heat oil in a wok and deep-fry the wings until they are golden brown. Drain on paper towels and serve with a dipping sauce of choice.
" Hi!, I have compiled a list of the top Asian Food blogs, and yours was included! check it out atThe Daily Reviewer." This message came from ted@thedailyreviewer.com and i thank him for recognizing this blog to be in his list of the top Asian Food blogs. Thanks Ted and i hope my readers will be interested to know who the other top Asian Food blogs are. One of them is Andrea Nguyen - Viet World Kitchen from where i learned how to make these Banh Beo. This time i had the proper mould for the thin pancake and it was so much easier to make when the utensil is right. The only thing i added was some Annato seed oil to the shrimp, to give it a better looking orangy color.